My period started on Monday and i had pain on lower middle part of my stomach or belly button part.On Tuesday while I was sitting down on the floor i feel like a needle is poking me on the lower right of my stomach.Before we went to the park I put my hair in a bun to take a shower with just my body.After I took a shower my i felt like i was going to have a headache.So we went to the park and when we were about to leave i felt the needle poking in the lower right of my stomach.Then we went to safeway and KFC.When we got home,that's when I got a headache.And then at night,my headache got a little worse and i feel like throwing up so i slept for maybe 15-25 minutes then when i got up i feel a little dizzy.I went to our sofa and closed my eyes for a little bit but when i got up again,my headache was gone but i don't feel good.I felt tired and weak. It's Wednesday today and I still feel the needle poking in my lower right part of my stomach.The poking is not continuous.I still have my period this day and im 18 years old.Im not pregnant.Sometimes when i move or sit down or stand up,i feel the needle poking in the lower right part of my stomach.Is this dangerous? do i need to see the doctor? im worried that it might be appendicitis. Join in and write your own page! It's easy to do. How? 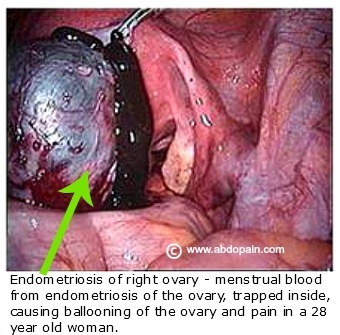 Simply click here to return to Menstrual Cramps.